Are Aeroponic Systems Revolutionizing The Way We Grow Food? Let’s take a look at how aeroponics works and then consider why this mode of growing is gaining in popularity. Aeroponics is the process of growing plants without soil. Plants may be nestled into troughs, tubes, or foam, and are fed a nutrient-rich solution via spraying or fogging. 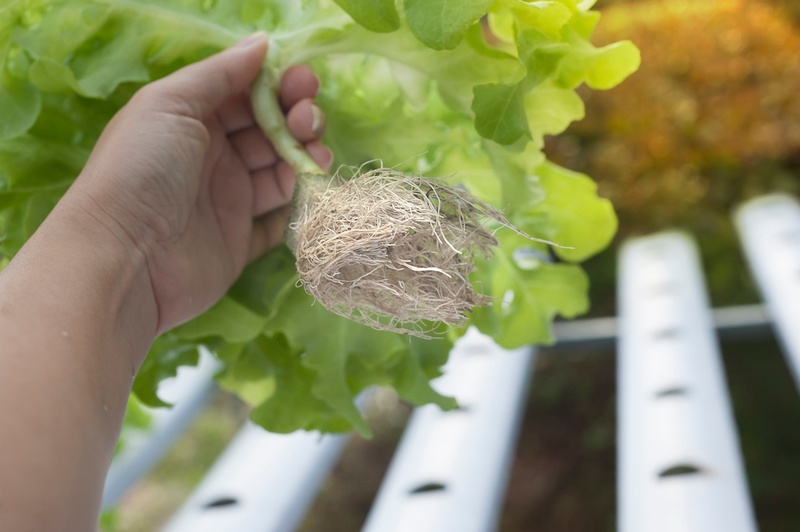 Aeroponics can be seen a subset of vertical growing, a general term that refers to agriculture which seeks to make optimal use of space-constrained environments. Typically, in an aeroponic grow, the roots of the plant are fully exposed. Constant microbursts of atomized water keep plants hydrated and nourished. One prominent commercial example comes from AeroFarms, which has built what it claims will be the world’s biggest vertical farm in an abandoned steel mill in Newark, N.J., producing two million pounds of leafy greens a year. According to one report, “The company has spent some $30m to bring to reality a new breed of ‘green agriculture’ that seeks to produce more crops in less space while minimizing environmental damage, even if it means completely divorcing food production from the natural ecosystem.” . With close to 100 employees, this farm boasts a range of technological supports, from high-tech lighting to computer-driven monitoring. The company says its aeroponic approach can increase crop yields by as much as 70 times compared to traditional field farms, without using any pesticides or fertilizers. Aeroponics are a means to get around the geographic restrictions that may constrain conventional farming. As a wholly indoor grow, this method can be pursued in any climate and plants can be grown year-round. This method may be an ideal solution for those challenged by space constraints, such as urban growers who find arable land hard to come by. An essentially vertical approach, aeroponics allows farmers to make maximum use of a minimal footprint. More product with fewer resources. Plants grow fast in an aeroponic setup, in part because their roots have constant access to needed nutrients. Farmers can drive bigger yields while using fewer resources, since water and feeding can be precision regulated in micro-doses. There are other benefits from the grower’s point of view, on the commercial side and also on the social front. From a commercial point of view, aeroponic systems allow the grower to bring food closer to the consumer, helping to meet the rising demand for locally grown produce. It’s relatively easy and cost-effective to set up an aeroponic plot in an urban or near-urban environment, and even a small grow can generate enough produce to make the farm commercially viable, especially with consumers calling ever more clearly for produce that is fresh and locally sourced. From a social point of view, the rise of aeroponics could help beat back the trend toward so-called food deserts, big swathes of urban land that are not served by present food distribution models. Creative growers are leveraging hydroponics as a means to close the gap for those who lack ready access to free produce. Aeroponics can help a startup grower or an expanding operation to claim and hang onto market share. Ideally, such a farm will be supported by key technologies that help to make the most of the soil-less environment. Sensors and monitors can help to ensure a suitable growing environment for plants that literally live off the air. Farmers can remotely monitor temperature, humidity, and other key variables in order to keep plants healthy and thriving, with app-based tools allowing for remote management of the aeroponic grow. Such tools make the farmer more efficient by allowing for off-site control over the agricultural environment, while at the same time ensuring a strong and healthy aeroponic crop.